What good is a copier to you and your business if it doesn’t run well, and run consistently? Not much. It’s just a nuisance at that point. That’s why the sales and service of copiers is just as important as your purchase decision. When you buy or lease a copier, you want to make sure it’s in top shape at all times – that it can serve all your printer needs with ease. Perhaps you already have a copier and it keeps breaking down. We’re just a phone call away. At Sunrise Office in Las Vegas, we’ve been servicing and repairing machines since way before digital printers were even an idea in someone’s head. We know what we’re doing; we’ll get your copier fixed fast and get it right the first time. Our technicians are personable, communicate well, and of course, know the ins and outs of all makes and models of copiers. 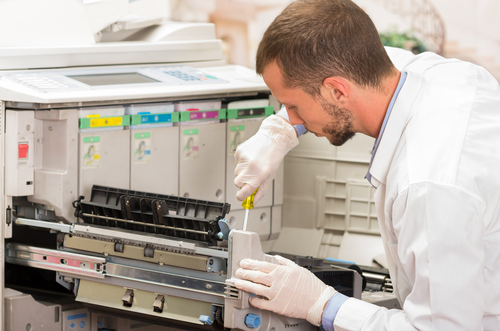 We specialize in service and repair for all name brands from Xerox to Lexmark. At Sunrise Office Systems, we believe you should have peace of mind about your copier – and feel confident about the business decisions you make. One important decision in buying a copier is whether it will be more cost-effective to purchase new or used equipment. With the rapid rate at which technology changes these days, it may be hard to find parts and supplies for an older model copier. In addition, if the machine breaks at some point, used machines are generally not covered under a service warranty, so you’ll need to pay the repair bills out of your own pocket or budget. However, if you just make occasional copies, a used copier may be all you really need. At Sunrise Office System, we offer emergency repair of copiers, but with us on your team, it’s our job to maintain your equipment to help prevent emergency situations. So, we also offer regular maintenance. We’ll clean and inspect all your copiers and printers throughout the year to avoid emergencies. We identify malfunctions before they become complete breakdowns. All of our service technicians are factory-trained in top sellers from the printing and copying industry. They stay on top of emerging printer technologies and evolving copy machine functionality through continuing education courses. They know their stuff, so you can focus on yours. By getting your copier serviced through Sunrise Office Systems in Las Vegas, you’ll also protect your copier’s warranty. Regularly-scheduled service protects the machine’s warranty if it’s still within the covered period. Rest assured that if we find a manufacturer defect, the warranty will still apply regardless of any service performed by us. We’ll let you know what’s happening at all times. In addition, all of the parts we use are manufacturer-approved parts. If you keep on having paper jams. If the toner on your copier isn’t working right. Or, for any other printer problem, call us today. We can help. Please note that Sunrise Office Systems provides mobile service only. We come to you!